Most of us are patriotic, many of us more so than others. 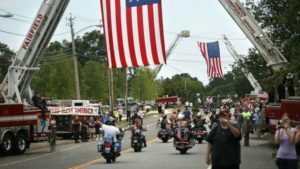 This last summer EDN helped support a local event that not only celebrated freedom and it’s expression, but the preservers of that gift: the families of our local fallen soldiers.The Inaugural “Rebel Rally” was held on September 25 -27 this last year. It featured live music both days, camping, a beer garden sponsored by Western Beverage, and an amazing array of giveaway prizes and a helluva rodeo. 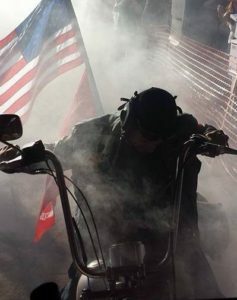 Conceived by Jeremy Hunsaker – the lead organizer for The River Road Rebel Riders; a casual harley riders group, Hunsaker had only two things in mind: Have some fun with 300 or so of his closest friends, and raise some money for Fallen Soldiers NW. Raise money they did. Tribute to Fallen Soldiers NW travels the country honoring the fallen and helping their families. Travelling the country honoring the fallen, that’s a monumental task. According to Fallen Soldiers NW, their last ride, a 12 day – 2,500 mile tribute ride, was their most successful. The ride procession stopped to visit and honor ( 25 ) fallen soldiers and their families left behind, escorting the Fallen Soldiers Memorial Flame through six states ( Oregon, Idaho, Utah, Colorado, Wyoming and South Dakota ). During the kickoff meeting, Hunsaker pledged the proceeds from the Rebel Rally Rodeo to Tribute to Fallen Soldiers NW. This Saturday, February 27th at Latus Harley Davidson in Eugene, they’ll be doing just that. Please join the Rebel Rally Staff and supporters as we present the funds raised from ‘Rebel Rally 2015’ to ‘Fallen Soldiers Memorial NW’ Saturday, February 27 from 11-3pm. ‘Latus Harley Davidson of Eugene’ is sponsoring the event. Live music and food will be provided by ‘Latus Harley Davidson Eugene’. There will be a ride after the presentation. Please come down and show your support for a great cause. Additionally, ‘Rebel Rally 2016’ is sponsoring a ‘Poker Run’ Saturday May 21, 2016 at Three Rivers Casinoto promote ‘Rebel Rally 2016’ and kick off the ‘Rhododendron Festival’ in Florence Oregon Friday, May 20th – Sunday May 22nd 2016. Latus Harley Davidson is located at: 86441 College View Road, Eugene, Or 97405. EDN Will be there, join us…and bring your bike.